Our low cost Trombone rental scheme is designed to get you started with the best possible instrument so playing is easier and more fun! The Yamaha YSL-354 Tenor Trombone is the best Trombone to start on as it's easy to play, sounds great and is very reliable. When you rent a Yamaha trombone, you get a case, slide cleaning rod, and mouthpiece; in fact everything you need to get started. We even get the our Brass Repairs workshop to check everything fully and play test the instrument before it comes to you. The YSL354ECN Tenor Trombone is suitable for most players. 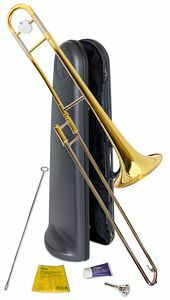 The YSL-350C is ideal for children who can't stretch their arms far enough to play all the slide positions, but it is also suitable for adults playing trombone in marching bands and other situations where space is limited.